The fluid in your transmission is as important to its operation as the oil in your engine. 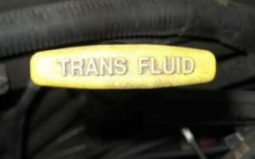 If your transmission has a dipstick, you should check the fluid level and condition of the fluid at least once a month. Check your owners manual for the procedure for checking your transmission fluid. Usually you drive the car for several minutes to bring fluid to normal operating temperature, then park it on a level surface and leave the engine running while you check the level. For Honda cars, you turn off the engine and check it immediately. 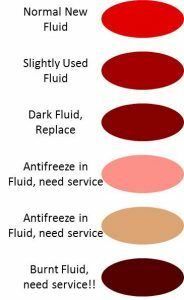 Automatic transmission fluid degrades over time because of heat generated in the transmission during normal operation. The fluid should be bright red and have a slightly sweet smell. If it is a dark color or has a burnt smell, you should have your transmission serviced. If the fluid has a pink or tan color, it has water and antifreeze contamination. Some cars do not have a dedicated radiator for the transmission and a leak plus the high pressure of water in radiator forces antifreeze into your transmission. 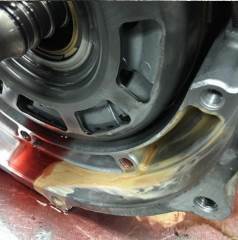 This will damage it and you should have your transmission serviced. If the fluid level is low, check your parking space for leaks of red fluid. You may have a leak in a broken seal, cracked fluid line or a leaky torque pump. Unlike engine oil which can burn up in your engine, if transmission fluid is low, you most likely have a leak. You should have your transmission serviced. If you want to stop by our shop, we will check it at no cost to you. If you want, we can show you how to check it on your own. It is a simple task that will take less than a minute a month but can save you thousands in costly repairs and keep you from being stranded by the side of the road. The fluid in the manual transmission is a lubricant and over time can pick up metal fragments. Manual transmissions seldom have a dip stick, but it is easy for a mechanic to check the fluid in your manual transmission when you have your engine oil changed and the car is up on a lift. The other thing you should do is observe when the clutch pedal engages the clutch. This should happen mid-way thru the range of pedal motion. If it engages near the top or the bottom of the range of motion, you may not be able to fully disengage or engage the drive train which will shorten life of the clutch and risk damage to the gears. Adjusting the clutch is generally a simple repair. Stop by our shop for a free analysis.